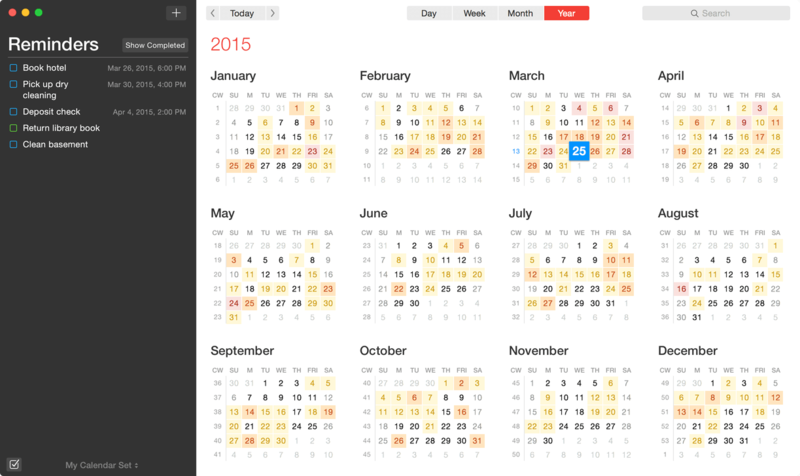 Flexibits | Fantastical 2 for Mac | Meet your Mac's new calendar. The calendar app you won't be able to live without. Learn more about what Fantastical 2 has to offer by watching our video tutorials. The original Fantastical was only a menu bar app. With Fantastical 2, we've reinvented Fantastical and made it a full Mac application, without losing the benefits and convenience of the menu bar window. Fantastical's natural language engine is expressive and intelligent so you can write in your own style. Fantastical automatically recognizes the location of your event and can even invite people from Contacts to your event. 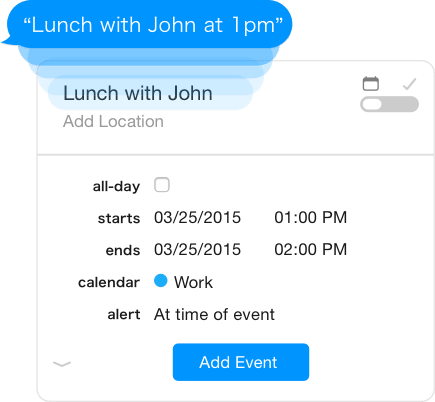 Use natural language to create repeating events and reminders, add alerts (like "Meeting 3pm alert 1 hour"), specify time zones (like Recital at 7pm PST), and more. 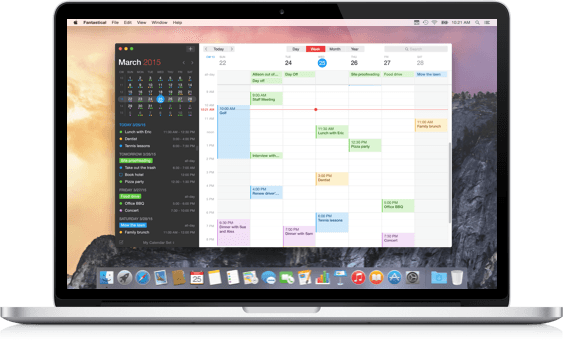 Fantastical 2 is the calendar app your Mac has been waiting for. It's my favorite calendar app for OS X. Terrific new version of one of my very favorite apps. The calendar app you've been waiting for. 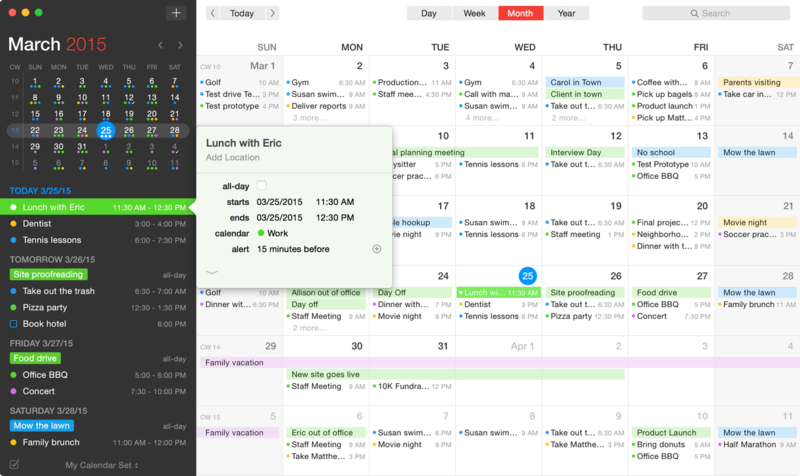 Fantastical 2 is a crazy-powerful calendar app for your Mac. Fantastical 2 lets you quickly toggle multiple calendars on or off with a single click, so you can focus on what's more important in that moment. The days of going back and forth, clicking multiple times, just to hide and show your calendars are over. But we didn't stop there. You can even automatically switch Calendar Sets based on your location (i.e. Work and Home). How cool is that? The Mini Window that started it all is back, better than ever. Fantastical's Mini Window resides in your menu bar and lets you create, edit, and view your events and reminders instantly. With Fantastical 2, you can now drag the Mini Window away from the menu bar, allowing you to position the window anywhere you like. And the new infinite list makes it easy to find all of your events and reminders, no matter when they occur. Fantastical supports the same reminders as macOS and iOS, giving you the fastest way to create or update your to-do list. Creating a new reminder is as easy as creating a new event: just type in what you need to get done. Fantastical 2 now features a focused reminders list, as well as support for location-based reminders. Fantastical has its own engine for CalDAV and Microsoft Exchange: This means you can add your calendar accounts directly into Fantastical. Fantastical supports iCloud, Google, Microsoft Exchange, Yahoo, as well as any other CalDAV account. 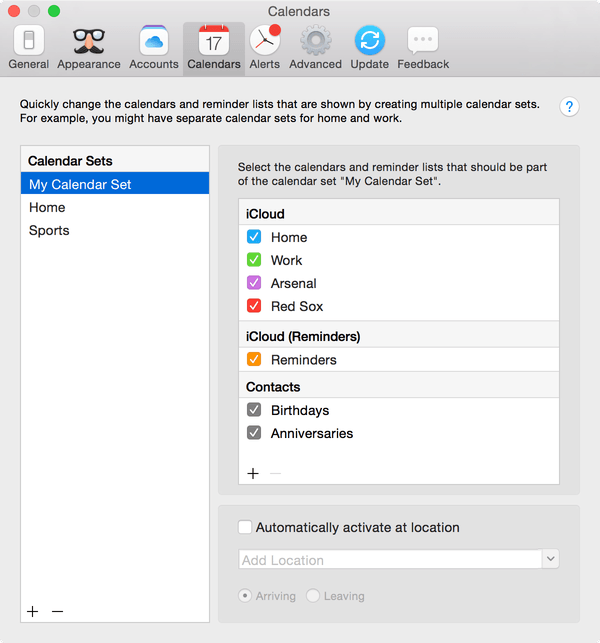 If you don't sync with a calendar service you can still use the local calendars in your Mac's built-in Calendar. Fantastical's Today Widget gives you convenient access to your schedule. The new Share and Action Extensions make it super easy to get data into your calendar. Just select some text in Safari, Mail, or any other app that supports extensions and send it to Fantastical instantly. Fantastical supports availability and scheduling, allowing you to quickly find out if coworkers are available when creating a new event. Scheduling requires a supported server, such as Google Apps or Exchange. iCloud does not support availability. Other Exchange features such as categories, attachments, invitation response and cancellation messages, invitation forwarding, and accepting or declining an invitation without sending a response are fully supported. Fantastical also is full of other conveniences, such as push updates for Google, Exchange, and Office 365, response messages for Google, Google Hangouts links, printing, and undo and redo support, just to name a few. Fantastical is fully localized in English, French, German, Italian, Spanish, and Japanese. Simply enter your event or reminder in any of those languages and Fantastical will automatically understand. Fantastical is also available for your iPhone, iPad, and Apple Watch as separate apps which all sync seamlessly. Fantastical also supports Handoff, allowing you to seamlessly transition between Fantastical on all of your devices. The frustration of calendars has been solved. Copyright © 2011-2019 Flexibits Inc.